Before long, Biba was Mecca to everyone from shopgirls to debs…. Not only did the clothes look amazing, you could afford to buy something every week. I remember I bought a dress in brushed cotton jersey, lemon with shocking pink zig zags… Already the hemlines were creeping up. It was two inches above the knee. The first dress I bought was a linen shift with a keyhole neck. Another one I remember was A-line with tight, tight sleeves that ended in a puff at the shoulder, with little pearl buttons at the neck. All classics. If only I had kept them. It wasn’t like any other shop I had ever seen. There were no rails, just clothes hanging off wooden hat stands and wicker baskets filled with T-shirts like vests with shoe-lace necks. There wasn’t even a proper changing room and not even that much choice. The clothes changed all the time… there were no women saying ‘can I help you madam?’ just young girls with long blonde hair wandering about tidying up the clothes that littered the floor and hanging them back on the hat stands…. observations: When Lucy Fisher, friend to this blog, recommends a book, then I always listen. She said I should read this, so I did: it is no work of literature – considering it is ghost-written it ought to be a bit better – but it does tell a fascinating story, and my goodness Twiggy loves her clothes. Her eye, her passion, her memory for virtually everything she ever wore is riveting. Although she came from nowhere as a model (no experience, no contacts, not really tall enough), you suspect that if she hadn’t been derailed she would have had a most successful career in her first choice, which was clothes design. One excellent detail is that before she hit the big-time, she was making enough money to live on just by making a couple of pairs of trousers a week for a market-stall. Biba was one of the game-changers of the 1960s until eventually they went out of business – it was very dark in the shop, and was widely believed to be a shop-lifter’s paradise. 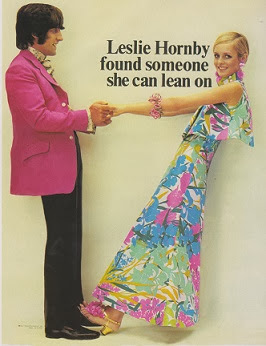 Everyone did love the clothes, and the top illo is from one of the mail order catalogues they produced in 1968/69 so that young girls in the provinces could aim to look like that too, or at least look at the pictures. I once got stuck in a Biba dress (brown and lurex stripes) and those girls with long blonde hair were no help. ("You got into it - you can get out of it.") The largest size was about a 6. But the shop was lovely. Just what you'd expect. Was it communal changing-rooms? - How I used to hate them, do they exist any more? That's hilarious, Lucy! Should have left saying "OK, so I'll diet and bring this back when I can - let you know how it goes..."
No amount of dieting will make me 5ft 4in - Miranda Hart can borrow the idea. Also hilarious is the fuchsia pick blazer.Wow! The thing is, it goes so well with his haircut doesn't it? Oh, one more thing - we have a sample store here in Kirkland (right by Google, in fact) and theirs is a communal changing room - takes me back! And not in a good way, in my view. The horror! Is it a good shop, does it seem worth it? Moira - This sounds really interesting as a piece of history as much as anything else. Let's face it; 'Twiggy' was one of those who defined that generation's look. People like her and Mary Quant set the tone and it must have been interesting to get her take on the fashion/culture world of the day. Exactly Margot - it doesn't matter how pedestrian the prose is, the story she is telling just has to be fascinating to anyone interested in popular culture of the day. I don't think I'll be getting this one TBH, I might just wait and see if my 15 year-old finishes and recommends the Katie Price auto that her sister bought for her as a joke from Poundland! Communal changing rooms were the FUTURE! And then they rapidly disappeared as tower blocks were dynamited and the New English Bible was pulped. I'm still waiting for the paperless office, myself. I am torn. On one hand, I am not sure the type of detail in this book would keep me going. On the other, I adore Twiggy. I loved her in The Boy Friend, which is one of our favorite movies of all time... because of the tap dancing mainly, but really everything.